I've been bit by the Alox bug,well at least a little bit. So my question to all of the truly rabid Alox fans is; Where do you find the colored Alox Farmers,such as the blue and purple? Is it a matter of scouring the internet or is there some other method of obtaining these colorful Alox Farmers. Don't worry,I'll keep your secret safe from other Alox fanatics.LOL. 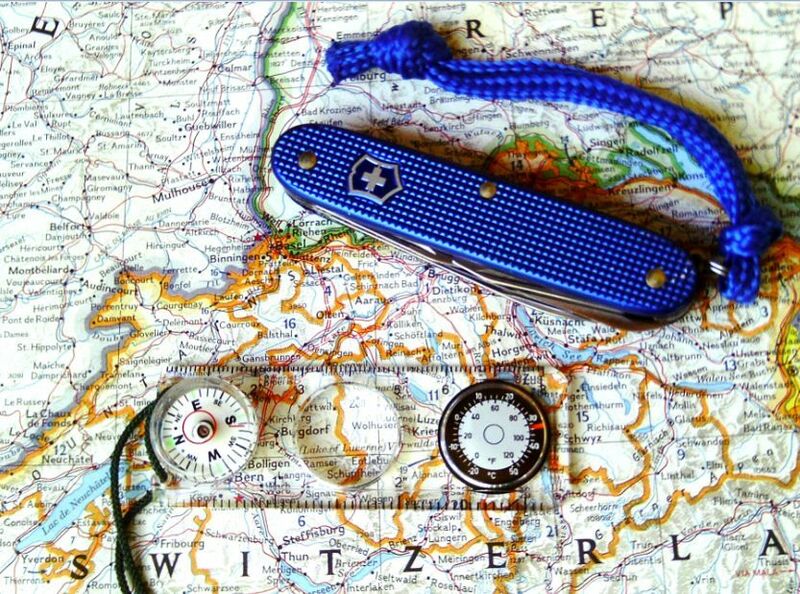 Re: Where To Look For Alox Farmers ? Farmer colors are a bit difficult. The purple one was a limited run and only 37 pieces were made in May 2010 so it would be a hard task to pry one out of the hands of a collector. And if, then at crazy prices. Same for the most other colors. Blue and red Farmers were released again last year for the German market but it was a short run and I don't think they are available anymore. None of my links work anymore but here's the relevant thread from back then. Orange was available in the US by Cutleryshoppe but it's also sold out. Thanks brother for your post and the numerous links. I really didn't know the purple Farmer was such a limited run. I was paying attention when the orange Farmers were released and managed to buy them.I also found the Italian dealer and ordered the black farmer,which I received a month ago. It appears that I may have a chance,although slim, to buy a blue one but the purple seems almost impossible at this point. Those colors are very cool. I just started collecting Alox a few months ago and I've been fortunate to be able to collect the silver,black,red and orange Farmers. I know in any endeavor,especially collecting,that patience is important but sometimes difficult. I started buying SAKs occasionally back in the 1970s, and started seriously collecting them about 15 years ago. 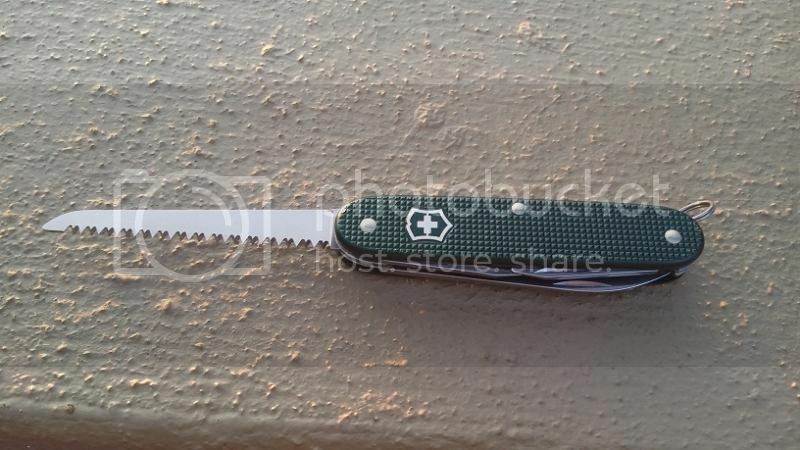 I regularly find coloured Alox models on ebay, not exactly cheap though. If it ain't a white cross, it ain't the real deal! I had a ltd edition green farmer once. I was going to sell it. Then wifey took a shine to it. "Nothing endures but change" - Heraclitus. 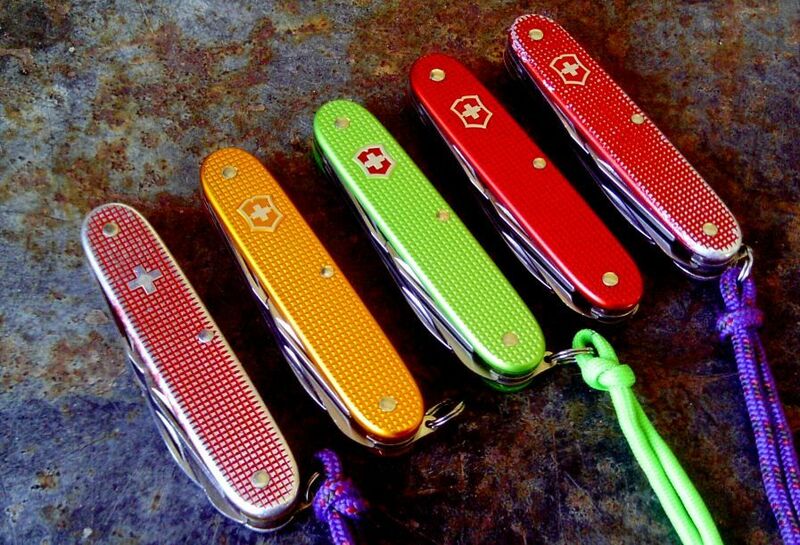 I have a few, but then, it's really the only model of SAK I actively collect. Wow! When I grow up I wanna be just like you! Kidding aside, great collection Mr. W! I only have one, this green common? Nope, not common outside of South Africa. But you guys do have a wide selection of colors not available to the rest of the world. Thanks to Stan the man! This blue is an absolute killer.IMHO the best color that I've personally seen. Actually they are. 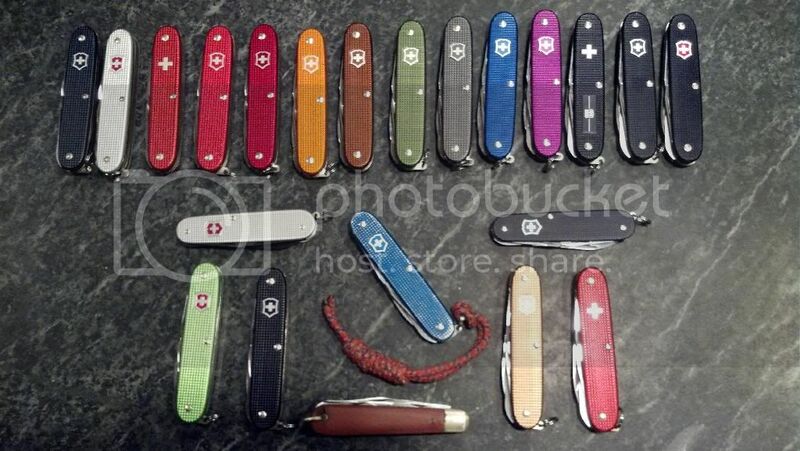 Most of those with solid colors are early pieces from SwissBianco.